A Change is a request to deliver new functionality or to make updates to existing functionality, within a Release or Project. A Change lists the technical aspects of a functional change to a System and includes impacts, timings, approvals, and stakeholders. Users can add and edit Changes on the Change page. Users can also duplicate a Change, Bulk Lock Or Unlock Changes, or Delete Changes. The sequence of Change Statuses for each Change Type. The User Groups or User Roles that have the permission to update each Change Status. For instance, a Change Type might have a workflow based on the Change Statuses: Draft > Active > Complete. All User Roles might have permission to change the Change Status from Draft to Active (using the Status drop-down menu) but only a Manager User Role might have permission to change the Change Status from Active to Complete. This workflow allows managers to check each Change before it is completed. If the Enable Change Workflow checkbox is selected in Change Status Customization, users can click Expand Workflow to view the Change’s workflow path. Clicking Collapse Workflow hides the workflow. Go to + New > Other > Change. Click the blue-linked ID or Name to open a Change. Type a Name in the Change Information tab in the Information panel. Only Releases with this Portfolio Association will appear under the Delivery Release tab. Users can now GET and PUT Linked Changes through the API. Click Save if you are adding a Change and Linked Changes is grayed out. Only users with the Edit Change permission can add or remove Linked Changes. A Linked Change can be related and a parent, or related and a child, but it cannot be a parent AND a child. Click the combo box and click to select the checkboxes of one or more Changes. Click the green cross button to add the Linked Change or Changes. Remove a linked Change by clicking the white X. This panel has replaced the Additional Information tab. The fields have been added by administrators using the Change Custom Fields Customization and they will vary between each Plutora installation. If a Change Additional Information field appears in more than one tab, it will remember the last information added. Select a Change Status from the Status drop-down menu in the Details panel. Change Status is customized using the Change Status Customization. Select a Change Theme from the Theme drop-down menu. Change Theme is customized using the Change Theme Customization. Select a Change Type from the Type drop-down menu. Change Type is customized using the Change Type Customization. Select a Delivery Risk from the Delivery Risk drop-down menu. Change Delivery Risk is customized using the Change Delivery Risk Customization. Select a Priority from the Priority drop-down menu. Priority is customized using the Change Priority Customization. Select a business value score from the Business Value Score drop-down menu. Select the person who raised the Change from the Raised by drop-down menu in the People panel. The Owner field will be managed under the Stakeholder tab. See below. Select a User or User Group from the Assigned To drop-down menu. Previously, users had to be added as stakeholders to a Change record before they could receive notification emails about updates to that record. Now, users or User Groups can be added to the Assigned To field and receive email notifications without being stakeholders. Raised on: A system-generated field with the date that the Change was raised. Implementation date: This date is taken from the Release under the Delivery Release tab (see below) which has the Actual Delivery Release checkbox checked. Expected delivery date: Select the expected delivery date. Select Add File from the Add New drop-down menu. Select Add URL from the Add New drop-down menu. Type a valid URL in the Please enter a valid URL field. Changes need an Accountable Stakeholder. This Stakeholder appears in the People panel halfway down the right side of the Changes pop up. 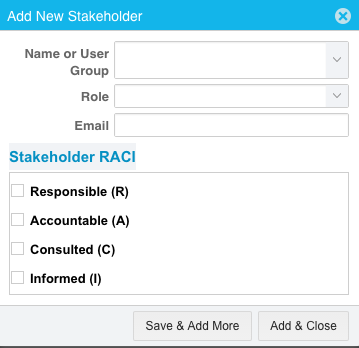 To add an Accountable Stakeholder, add a Stakeholder and select Accountable in the Stakeholders RACI matrix. Click Save & Add More if you have more stakeholders to add. Click Add & Close to close the pop up. Search for Systems using Live Search. The Change may have a future impact on Systems. The Releases (with a delivery date in the future) which are associated with these impacted Systems will appear under the Delivery Release tab. Impacted Systems have their own column on the Change page. Impacted Systems can be searched for in Query Builder. The Change may impact on already-existing Systems. Changes with a regression risk can be searched for in Query Builder. Remove Systems by dragging them back into the left-hand Systems Available panel. Release & Change <–> Portfolio Association/Organization. In other words, a Release under Delivery Release tab is associated with a System that is associated with a Change and both the Release and the Change must be under the same Portfolio Association/Organization. Only Releases that do not have an End State will appear under this tab. Releases will not show under Delivery Release tab if they have an implementation date before the current day. Checking Target Release makes the Change appear as a circled number for that Release in System Impact Matrix. eikiChange9031 was worked on during eikiindependent9031 Release but not finished and moved to eikiindependent9031-2 Release to be finished. Both Releases will need the Target Release checkbox checked. Then, in the System Impact Matrix, eikiindependent9031 and eikiindependent9031-2 will have a 1 next to them showing that a single Change impacted them both. But the Total Changes of that column will be 1 and not 2 because only a single Change is involved. Click to select the Actual Delivery Release checkbox. The Change will appear under the Release’s Changes tab. The implementation date of the Release will appear on the Change’s Implementation Date in the Change Information tab. Because eikiChange9031 was worked on during eikiindependent9031 but not finished and moved to eikiindependent9031-2 to be finished, the Actual Delivery Release is eikiindependent9031-2. External Resources tab contains records of external systems that are not managed in Plutora. To make rows appear by default, see the External Systems Customization. Click to select an External System from the Click to add External System drop-down menu. Click to select an External Change Type from the Click to add External Change Type drop-down menu. Administrators can customize External Systems and External Change Types. Type an Identifier, which can be a version number, a name, or another piece of text. Click to select a row. Linked Items tab shows the TECRs that have had this Change record dragged and dropped into the Change connected to TECR panel under the Linked Change tab in TECRs. Type a search keyword into the grid column selector header search fields. The comments tab allows users to comment on the Change and answer other user’s comments. Click Reply on the comment. Save and close your Change. Save & Close will be grayed out if the Change is locked. Change records can now be locked or unlocked by users with the Lock Change user permission. Locked Change records cannot be edited or deleted. Administrators can prevent completed records from being edited. Users editing the same record cannot save over each other’s edits. Bulk update will not save over any record currently being edited. Bulk delete will not delete any records currently being edited. To lock or unlock Change records in bulk, see Bulk Lock Or Unlock Changes. Click the lock button in the top-right corner to toggle between locked and unlocked states. Locked records will be grayed out. Locked records will remain uneditable until a user with the Lock Change user permission unlocks them. Audit History now contains the history of when the Change record was locked or unlocked. Users can copy a Change’s URL to the clipboard by clicking the Copy to Clipboard button on the top right of the pop up. To see more information about copying to the Clipboard, click here.